THE grilling cookbook we've all been waiting for! Packed with mouth-watering meat recipes and great descriptions of the meats themselves, Dad will love this gift the most for Father's Day! Everything your need to know to have a great grilling experience. The Total Grilling compiles the best 250+ skills from a number of top grilling and outdoor cooking experts, all accompanied by step-by-step guides, recipes and photographs. Equipment From charcoal to wood burning, gas to oven - find the most up-to-date guide to the best grilling equipment, the information you need to properly use each one. Fuels Keys to picking the right fuel(s) or charcoals for your grill and more. Tips and Stories All the legend and lore from all the grilling pros. From how to make the perfect burger to smoking techniques, find all the expert advice here. Recipes From steaks and ribs to shellfish and sides this section has a recipe for everyone. 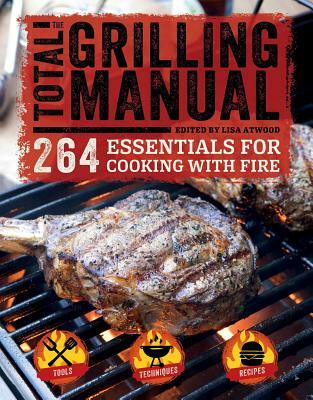 Whether you're looking to polish up your grilling skills or are buying your first grill, the Total Grilling Manual, has everything you need to successfully serve up any meal. Pick up this essential guide for the griller in your family, or for yourself.